Founded in 1990 and headquartered in New York, Bloomberg News is an international news agency. I am a business news reporter with Bloomberg News in London. What I enjoy most about the job is the exposure to the fascinating world of global financial markets and the opportunity to make a difference by writing informed, insightful stories and analysis that helps various market stakeholders to make sense of the latest developments in the fast-paced world of finance. I landed my present stint after applying to Bloomberg's summer internship programme last year while studying at City. An interest in financial journalism and past experience in the field in my home country India led me to specialise in this role. It was my interest area in the field of financial journalism that led me to enroll for the MA in Financial Journalism course at City which was a one of a kind course that came with a formidable reputation and a scholarship without which I could not have managed. The course was instrumental in leading me to my current career path now as it provided me with a thorough understanding of the top issues in the world of finance and gave me a solid academic foundation as well as practical training that I could then leverage in the highly competitive job market to land my dream job. The course also helped me develop my soft skills such as working under pressure, managing my time and building confidence. It sharpened my tool kit by teaching me how to create an impactful CV, cover letter and make a mark in interviews with potential employers which made all the difference in the end. I enjoyed being challenged out of my comfort zone. I enjoyed the depth and rigour of the wide variety of lectures and academic discussions with my professor. I also enjoyed the unmatched global exposure I got through the course's summer school programme in China and the U.S. This helped me become a well-rounded financial journalist with a global world view, armed with an insatiable intellectual curiosity. The hardest part was the constant struggle for time management. Balancing the rigorous academic demands of the course along with managing my four internships, job applications, tests and interviews. My to-do list was never ending with often competing priorities and the course really pushed me to my limits to stay focused and bring out my best. My favourite part of being a city student was the relationships I built with my fellow classmates, other coursemates, professors, seniors, mentors and the invaluable lessons they taught me. Plus for me having worked for 7 years in India and then quitting my job to land a scholarship and move to the UK to study at City was an incredibly special feeling that made me feel I was living my dream every single day as a City student. If you could give one piece of advice to a prospective City MA Financial Journalism student, what would it be? I would tell students to try to make the most of the opportunities that come as being a City student and use each and every one of them to invest in themselves and their future career goals. Knowing what you want to get out of your course will give you solid focus and landing a few internships will go a long way to complement your degree with a great CV that is bound to be an winning combination putting you one step ahead of the competition. But above all I would just say having a positive and can-do attitude through all your struggles will stand you in good stead. MA Financial Journalism Alumni Manisha Jha talks about her experiences studying at City, University of London. 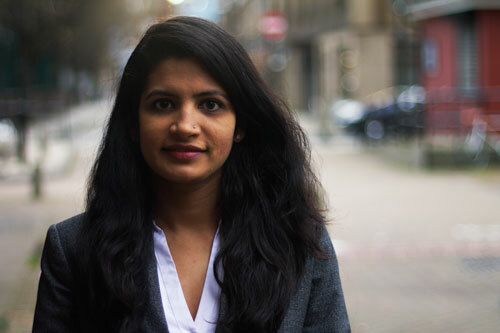 Manisha is from India where she gained an impressive CV before joining City, she is now a Rotation Reporter on the European Stocks team at Bloomberg.